Off the current success of collectible subscription boxes, like Loot Crate or Nerd Blox, Marvel & Funko have teamed up to create on of their own. Funko has collaborated with Marvel to build a first-of-its-kind subscription box service — Marvel Collector Corps — featuring 100% exclusive collectibles, apparel and accessories from some of the biggest events in the Marvel movie and comic book universe. The debut box ships in April and will feature items from Marvel’s ‘Avengers: Age of Ultron,’ including an exclusive 6” Iron Man Hulkbuster Pop! vinyl collectible only available through Marvel Collector Corps. The box contents also include a T-shirt featuring one of four exclusive designs, an additional stylized vinyl collectible and two premium accessories. The box represents over $50 of value. Boxes will ship every two months and Marvel’s ‘Ant-Man’ will be featured in the June box. The service includes two levels — the basic Collector level and the Founder level. Customers who sign up for the Founders program, which includes a six-box subscription, will receive an exclusive Founder Statue on the 12-month anniversary of their first box shipment. As long as their membership does not lapse, Founders will continue to receive a new exclusive figure every year on their anniversary. Funko has since confirmed that this will be the only way to get a POP! 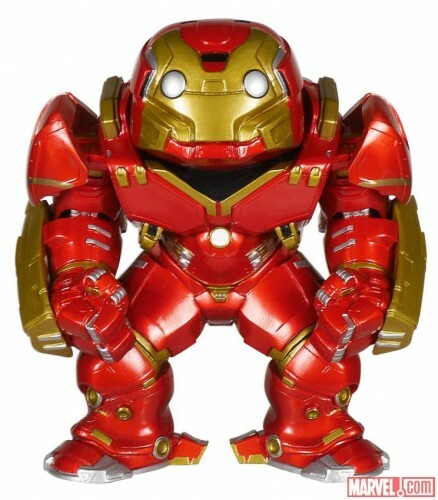 Vinyl of the Hulkbuster. I, for one, have already signed up for the Founder’s Level! You can read more about it on Marvel.com and sign up at CollectorCorps.com.